Featuring a carbon-fiber reinforced chassis, the X1 Carbon is durable, and it features a small footprint, making it extremely light and thin. Yet it's packed with power: excellent processor, lightning-fast Thunderbolt 3, and a 14" display. The X1 Carbon is extremely small and thin business Ultrabook™. You might find yourself checking a lot to make sure it's really there. With a small footprint, the X1 Carbon is easy to hold, to carry, and to take your work on the go. But the amazing part? Lenovo has packed in incredible processing power, large memory, and storage space to drive your business. Plus Lenovo has managed to keep the 14″ display in a 13″ chassis. 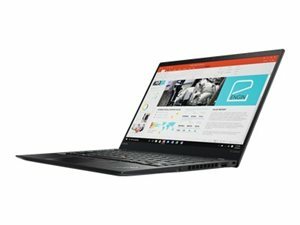 With four layers of carbon-fiber reinforced chassis and a magnesium alloy roll-cage for added strength, Lenovo has engineered the X1 Carbon to handle whatever comes your way. From spilled drinks, to drops and knocks, this laptop is compliant to military-grade requirements. Whether it’s a day at the office, or a day on the move, X1 Carbon has you covered. No more distractions and easy provisioning for IT pros. The X1 Carbon features Thunderbolt™ 3 — the technology, that brings lightning-fast Thunderbolt to USB-C at high speeds. Connect a cable from your USB-C port to a Thunderbolt 3 enabled device, and more the data and the video bandwidth, while also supplying power. So you get Thunderbolt, USB-C, and DisplayPort. Lenovo boasts an amazing, ergonomic, highly accurate keyboard. And the X1 Carbon delivers that same legendary interaction, that IT pros and end users alike have come to love and expect from ThinkPad — all day, every day.